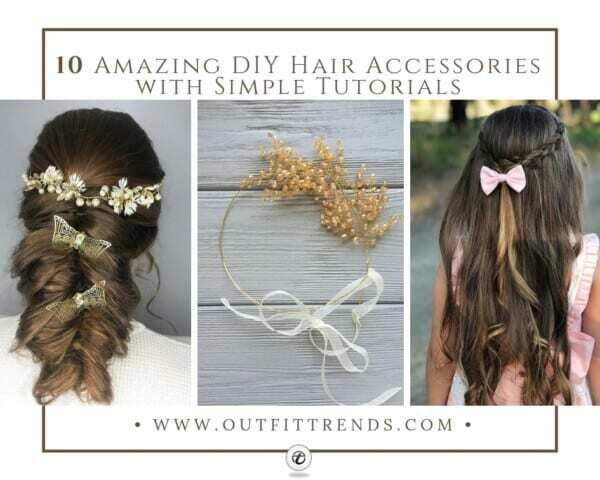 DIY Hair Accessories Tutorials: If you simply love experimenting with your look, you could really do with some different hairstyles. This can be done by making use of different hair accessories and while you are at it, why not try your hands at making your own cool ones. You can look absolutely ravishing with these on your hair. If you don’t want to waste your time and want to be creative this winter then you can make some DIY hair accessories. This way you can also show your creative side. If you are bored, you can utilize the time by learning some DIY tricks at home. Hair accessories are a must to add some style to the hair. You can use embellished clips and bands on your hair. Therefore we bring you ideas that are easy to do at home. If you have some old hair accessories at hand, using them can be perfect for this project. You can add a new life to them by using threads, stones, and applying glitter on it. Only a little effort can completely change the old clips into new ones. Buttons and threads can also be used on the pins to make them look creative. How To Make Hair Accessories At Home? To start with the DIY Hair Accessories Project, make sure to collect all the material needed. Headbands, clips, beads, bands, stones are a must-have when starting with the project. A little bling can beautify the accessories. A simple clip can be changed into a completely different clip by adding rhinestones, artificial flower, pearls, bows etc. Use elastics to add stretch to hairbands while another idea is to add a stick-on fabric to create easy-to-wear styles. Watch a couple of Youtube tutorials to get a hang of the tricks. You can restore old and broken items with the same tips. For example, chapped bobby pins can be spray painted to give them a new look. If you are fond of the Royal princess style hairdos, you must find the most elegant hair accessories for them. From bows and pins to gorgeous hair combs, they are all much loved. If you own a boring and dull-looking hair comb and are looking for ways to transform it, you are at the right place. Here is a super simple and easy-to-do tutorial on a Chanel inspired hair comb. All you need are some beads, strong glue and some old earrings. 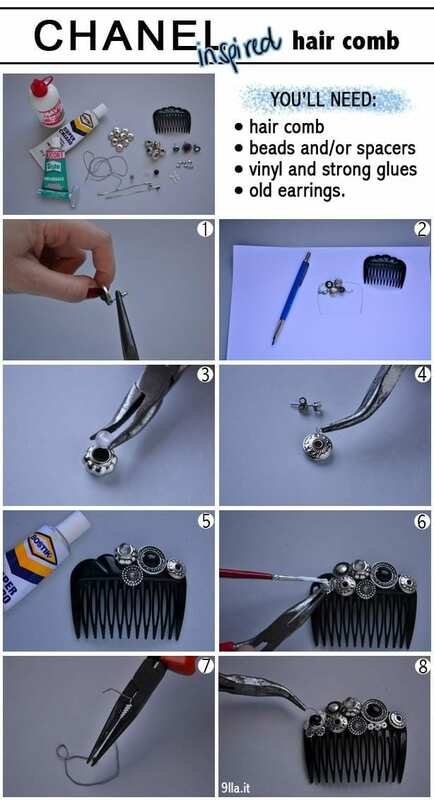 Remove the wire of your old studs and put them to use by sticking them onto a plain hair comb. By adding these gems and jewels, what you will now have is a bejeweled piece of hair accessory that you can wear to college or to work. If you have got long bangs that keep falling onto your face, all you need are either some clips or a cool-looking hairband to add to your everyday look. Hair bands are still in fashion and are now coming in different looks and styles. Our favorite one is the bejeweled hairbands that can go with almost every kind of outfit making it ten times cuter. If you have a plain black plastic or velvet covered hair band lying around somewhere, it is time to bid adieu to the old look. Find any beads, flowers, pearls, and gems to add to your hair accessories. With the help of glue, stick these embellishments one-by-one onto the hair band to get a super adorable looking piece of hair accessory. You can wear this with your plaid shirt and denim jeans or on a floral dress for the ultimate Spring look. For more ideas, check out these Top Celebrities Long Hairstyle Trends 2019 to Follow. What is a formal event without a pretty-looking hair updo? If you have a wedding or a birthday party to attend and cannot pick the right hairstyle, fear not. Buns are a girl’s best friend because of how easy they are to do. You can twist your hair and secure them with a pin or use the magic sponge to get a neat look. However, hair buns look dull and boring if not styled appropriately. Pick and choose stunning hair accessories to uplift a bun. You can add chopsticks with danglers or simply add pearl or bow clips to your bun. However, our favorite style is the use of flowers whether fresh or artificial. Since many people do not have the time and resources to find the right kind of flowers to style their hair buns with, you can make use of artificial flowers for a quick and easy hair makeover. All you will need are some flowers, a jute string, and a ribbon. Firmly secure the flowers by tying them onto a jute string, tying a green ribbon onto it. You can then run another ribbon through the ends to tie it around your bun. If you are not too fond of tying up the hair into buns and ponytails and need something simpler, here is a super simple yet cool hair accessory for you. Hairpins, clips, and bands are simple ways to glam up your hair. Instead of spending time and money on finding one that meets your requirements, why not create one that will also have a personal touch? This elegant and creative hairpin can solve many hair problems. If you have frizzy hair and need to tame them down, secure them with a simple pin or push them back by wearing a hairband. All you need is a metal wire and a couple of white pearls. Metal wires are easy to bend and twist to get the desired shape. Here is a bow-shape clip tutorial, however, you may try and use the same method to create different shapes and designs. Add the pearls to the metal wire, twisting to create a bow look. Once done, you can stick it to a basic black Bobby pin or onto a hair band for the ultimate hair accessory. You can also give it to a friend for some hair “twinning”. Who does not love some patterned hair clips? Most girls love to hoard hair accessories even if they are not being used. If you are one those, it is time to pull out your stash and give your pins an all-new makeover. If you have some washi tape, wrap it onto some chapped and old hairpins to give them new colors and designs. This way you can now match hair accessories with your outfits. Pin up your bangs and fringes with these ultra modern and cute hair clips for a new hair look. Washi tapes are easy to apply and can also be removed without damaging the product so now you would not have to worry about taping your favorite hair accessories. Lastly, with these tapes you will now have multiple colors and patterns to choose from, giving you a new look each day. Looking for a hairdo that is both simple and elegant? Here is something for you. The top knot seems to be a hot favorite of Jennifer Lopez, Kendall Jenner, Gigi Hadid and a number of other celebrities. You can try and replicate the hairdo by personalizing it with the use of different accessories. You can add in bejeweled chopsticks or tie a bow around it to give it a unique look. If you are into the idea of using a bow, here is how to create one while at the comfort of home. Cut a strip of your desired fabric to make a bow out of. Cut a smaller piece of the same fabric to create the mid-partition. Once done, you will now have a beautiful bow ready-to-wear. However, you can give it a little more detail by either sticking a few gems and pearls or by simply adding in a flower for some color. Cut out an artificial flower, sticking it at the middle of the bow. You can add in a hair clip to it to make it easier to wear. This bow can then be added to your top knot for a super easy and time-saving hairdo. Need something for your everyday look that is free of gems and stones? Lace would work wonders. After the trend of lace chokers, we bring you lace adorned hairbands. Not only can you wear it while out with friends, but it could also be worn to work. Hairbands are mainly worn for style purposes and this one definitely looks adorable. Many plastic hairbands eat behind the ear and get uncomfortable, however, fabric-based hairbands are easy to wear and are much more comfortable. Cut out thin strips of lace and any fabric that you would like to wear. Stick the lace onto the base and use stick-on to tie it around. Additionally, you could also leave the ends unsewed to create a manually tied knot hairband. However, for an easy-to-wear style, you could stitch a piece of elastic to it to give it a stretchy look. Give yourself a new hairstyle by wearing this hairband to your next Summer vacation. Here are 20 Best College Hairstyles for Girls with Medium Length Hair. Tired of losing your Bobby pins? You would start being more careful if they looked as beautiful as these stunning hairpins. Spray paint your basic Bobby pins to the desired color. They have been painted white but will look as pretty is colored pastel. Stick gems and crystals of different shapes and sizes to create different looks. These Bobby pins can be added to an elegant hair updo or can be used in the front to simply secure the bangs in place. Either way, these creative hair accessories will surely add some bling to your hair. Rhinestone jeweled bobby pins are super simple to create and can go a long way. Bows are the ultimate go-to accessories when it comes to cute and girly looks. You can go for a plain, textured or a printed bow. However, we prefer the vintage bows since they were quite the deal during the 1980s and 1990s. Many women wore them in bigger sizes, while others liked them small. If you are a huge bow fan, you could try to make one at home. We simply love this white bow with black polka dots on it that has been turned into a bow with multiple layers. You can follow this step-by-step tutorial and make more in different colors, patterns, and styles. Since this one is smaller in size, you can add a clip to it to wear it on the front or you can adorn a braid with one. All you need is a silk fabric, however, you can also add a couple of embellishments to it for a fancier look. If you are all for retro feels, here is an old classic hairstyle that you would definitely want to replicate. This vintage hairdo was much loved in the 1980s and still seems to be trending. The wearing of hairband on the forehead was quite popular in the old days and gave a very quirky and a funky look. We just found this super beautiful design of the same hairband in a twisted style. Give the old hairband a new twist with this unique style so pick and choose different printed fabrics to make your own. Start by twisting the fabric so it gets a knotted look, once done, tie it around your head. Since twists are easier to open up and might not be sustainable, you can also braid strands of the fabrics and try the braided style hairband which is also easier to make. sew each end of the braided side with an elastic band to give it some stretch. For a funkier look, you can braid different prints and colors to create something that is vibrant and unique. These funky hairbands can be worn to college or when out with friends to go with your casual outfits. While trying it on, you can also give it different looks by twisting it under a strand.